A beautiful way in which cirrus clouds manifest themselves is through halos - faint circles, arcs and spots of white or coloured light seen when sunlight or moonlight shines through thin ice-clouds. Cirrus is a nearly unique source of these displays because they are produced by the refraction of light-rays passing through ice crystals. A whole variety of shapes can be observed, with names ranging from the prosaic to the evocative: 22-degree halo, circumzenithal arc, sundogs, sun-pillar and Parry arc. A tangible demonstration that the new ice analogues do indeed resemble real ice was provided in September 2002 - we managed to produce realistic halo displays using the crystals. While laboratory halo simulations have been attempted before, the materials used either did not have the right shape - hexagonal - or had wrong values of the refractive index. The ice analogue crystals developed at the University of Hertfordshire have the correct refractive index for ice (1.31) as well as having hexagonal symmetry. We used the ice analogue crystals grown on glass and illuminated them with a parallel beam of white light - to simulate sunlight. We then allowed the light scattered by the crystals to fall onto a screen and took a photograph - see picture. 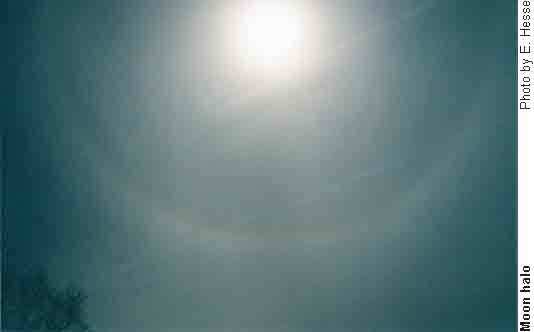 The result is a circle of light with an inner radius corresponding to an angle of 22°, just like for a real halo. It is also interesting to notice slight colouration of the display: the inner edge of the circle is reddish while the outer one is tinged blue. This effect is due to dispersion - the refractive index of the analogues is, like that of ice, slightly greater for blue light causing it to be refracted through larger angles. The ice-analogue sample used to produce the halo contained mainly large, hexagonal, column-shaped crystals - as can be seen on the Scanning Electron Microscope (SEM) image on the right, which shows the actual sample used to produce the displays on this page. Since the sample had to be quite "concentrated" to make the halo display intense, some crystals became joined together into aggregates or rosettes. Cirrus halos are the result of scattering on so many crystals - literally billions - that quite smooth displays are visible. Any unevenness is due to the clouds being inhomogeneous. 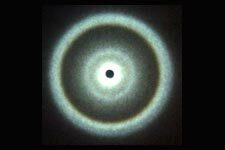 In contrast, our analogue halos are produced by only a few hundred crystals. 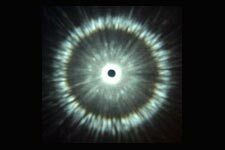 As a result spots of light coming from individual crystals can clearly be seen, like in the image above. However, by rotating the sample of crystals we can average out these spots and obtain a smooth display, better resembling an atmospheric halo - see right. 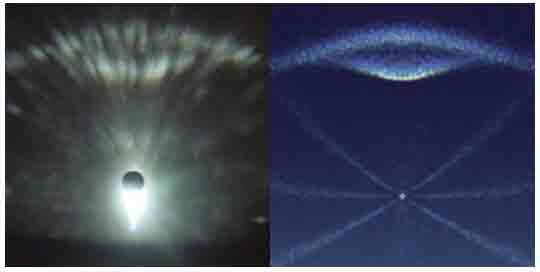 The rare Parry arc, usually appearing above the 22° halo, is thought to be produced by column-shaped ice crystals in a seldom-found orientation: not only aligned horizontally, but with one pair of facets horizontal too (the crystals are doubly oriented). While there is no satisfactory aerodynamic explanation for this orientation, there is no doubt that such orientation could produce the Parry arc. In our demonstration (above left), a sample of a few hundred columns on glass is tilted with respect to the illuminating beam of light to simulate sunlight coming from an oblique direction. 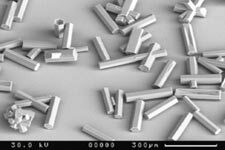 Since there is a large proportion of crystals with their facets parallel to the glass, as the SEM image shows, they will have the required "Parry orientation". However, there are also many crystals which have only their long axis parallel to the glass (the columns are singly oriented) - these produce the so-called upper tangent arc, which is the lower one of the two arcs in the image. For comparison we show a simulation of this display computed using the HaloSim program (above right). To demonstrate how the Parry arc evolves from the 22° halo we include an animation showing what happens when the crystal sample is gradually tilted by up to 70° (or the sun moves down from the zenith to an elevation of 20°): MPEG video animation.